I love vinyl LP’s. I got rid of all my records after high school, not appreciating them like I do now… and jumped on the ‘cd’ bandwagon in the late 80’s / early 90’s. I regret that move. Fortunately, there are awesome record stores like Random Records, in Durango, CO, to help me rebuild my collection. Owner Kristian Luce is super knowledgeable, super fair, and super friendly. Just a cool guy to hang out with. 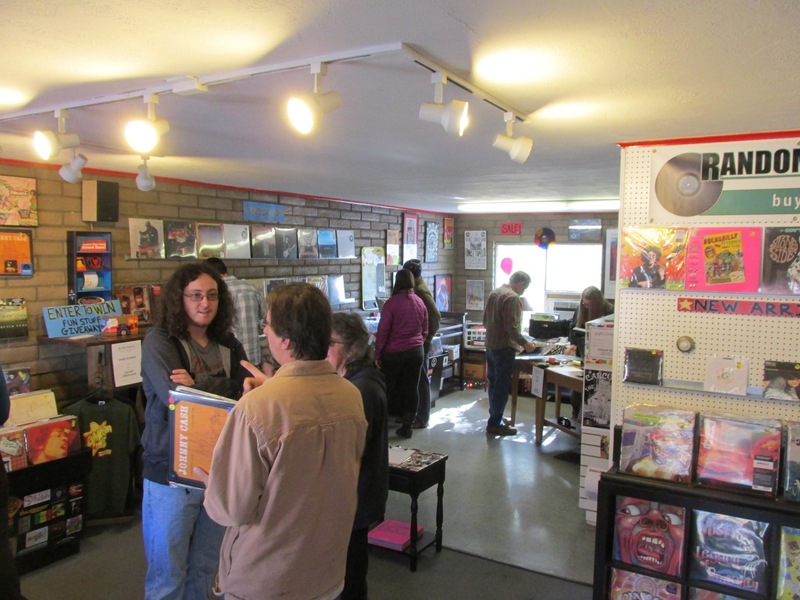 Record Store Day 2015 was a huge success at Random Records. Just being there on Saturday morning made my whole weekend awesome! So I’m in the record store, with 2 albums under my arm… some weird live AC/DC double album I’ve never seen before (new), and Gogol Bordello (with “Start Wearing Purple” on it). We run across main street without getting hit. I meet Joe. Going through a divorce. In his 60’s. Sad, lonely, maybe a little needy. And standing next to a box of LP’s. “You selling these?” I ask. “Take a look and see what you like, and you can have it,” he replies. Smelly. They got all wet in his basement. Sigh. He ends up giving me the whole freaking box. “Maybe next time… I just ate,” he says. So I put the stinky, moldy LP’s in my car. Eating lunch with Justin, Raequel**, and Abby**. Fish and chips at the Irish Embassy. Delicious. Then, suddenly, Justin’s phone rings. It’s Joe. Wants to talk to ME. Tells me what I can do to pay him for the LP’s… pick him up TWO BAGS OF DRIED PRUNES! Take the albums home. Spend a couple hours cleaning them, throwing away the nasty sleeves, wiping everything down with Lysol. 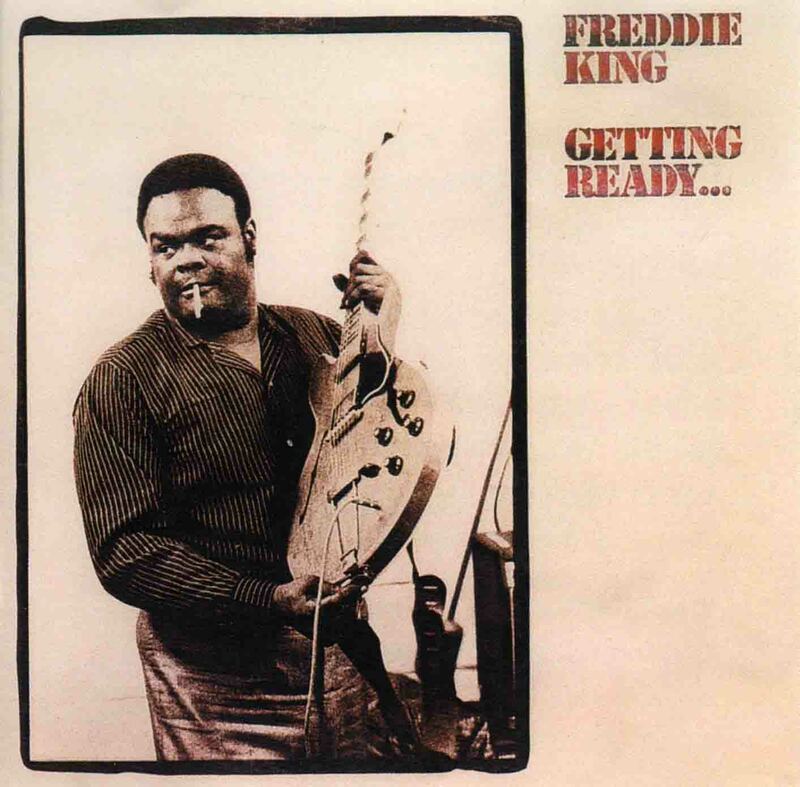 And now, my friend, the whole reason I’m writing this… I’m just chilling with Freddie King‘s 1971 release, “Getting Ready“. Not to mention The Blasters, Jerry Lee Lewis, Dire Straits, George Thorogood, Dr. John, Commander Cody and his Lost Planet Airmen, the soundtrack to Easy Rider… It’s a gold mine. What about you, Gentle Reader? What’s the strangest (and coolest) trade you’ve made recently? Filed under Living a joyful life, Wait... what? I’m not going to lie. I love vinyl. And not necessarily for the ‘cool’ value of excusing myself from some deep dinner discussion with friends to flip the LP. Well, okay. Maybe a little bit. But there’s something else at work here, too. At least two different things that I can tease apart. Or maybe three. Thing is, this Queen album takes me back. Back beyond my 30’s. Back beyond my 20’s. Beyond my awkward teen zit years. I’m talking all the way back to being 9 or 10 years old. My stepdad Wayne had this LP… and on Saturday mornings we’d build tents with the blankets and the couch and dining room chairs, and this album was in tight rotation with “News of the World” as the backdrop for those mornings. It was freezing cold outside on those miserably damp, icy, snow-covered, Rowley, Iowa mornings. I figured every other ten year-old kid was listening to the same stuff. That every other family stopped whatever they were doing for just a moment to choose the next LP to play. I figured every other kid with a pulse cared as much about music. The musicianship on both albums is incredible. Sometimes I witness excellent musicianship and I’m immediately inspired to play. (See the movie Rush: Beyond The Lighted Stage.) Other times, displays of incredible musicianship just make me shake my head and hang my guitar up for the evening. Both of these albums blow me away through the beauty of their simplicity AND complexity. Words are failing me. Best way to describe it is simply to go put one of these albums on. Sit quietly. Listen. Fasten your safety belt. Third… there’s masterful assembly of the amazing parts into a complete album. Dropping the needle on this 180-gram piece of wax transported me back through time. It also transported me into another world, changing the very environment / mood in my living room, in my mind, in my heart, with the sound scapes it painted in the air. It truly IS one of the perfect albums of all time. I truly don’t care if you agree, dear reader. It’s simply the Truth, with a capital “T”. I know I’m not the only one who feels this way. I may be one of billions of anonymous voices in the night. But plenty of famous people agree. Just check out “The Making Of… A Night At The Opera” on Netflix. The lengths they went to in order to capture the perfect album… I bow in humility. On one knee. The reason it feels like a knife cutting slowly into my heart and then ever-so-gently being twisted is not only because the album serves as a zoom lens into my own past. In addition, the sheer beauty of the sounds that jump out of the speakers simply make my jaw drop. Miles Davis — Kind Of Blue. Top-selling jazz album of All Freaking Time. Seriously. I don’t want to sound melodramatic. But as I sat on the couch this evening, sun streaming in the window, at the end of a pretty frantic week, listening to the last track on side two “Flamenco Sketches”… (not to be confused with the Miles Davis album entitled “Sketches Of Spain”, which I absolutely hate) tears rolled down my cheeks. There is no more perfect piece of music than that song. At the end of that album. I’ve tried making mix cd’s and including just one or two songs from Kind Of Blue. Can’t be done. You either listen to the entire album all the way through, in order, or you get up and walk out the door, down the block, and disappear into the darkness and don’t come back until you’ve had a chance to sober up. Okay. To be fair, I’m okay with listening to just one Side at a time. (Admittedly, I listened to Side Two this evening probably eleven times before interrupting.) But certainly, no less. To be clear, I’m purchasing vinyl (new and used) to ENJOY. To Play. On my cheap-assed turntable. I am not buying vinyl to ‘collect’ it, in hopes of increasing value or returned investment or whatever. 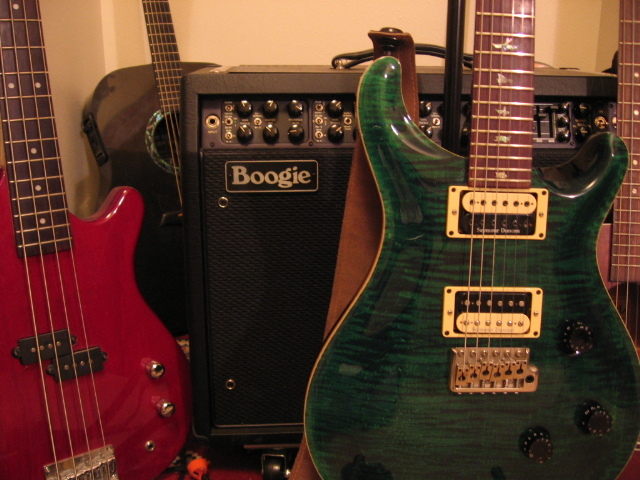 I plan to play the living daylights out of my records (just like my guitars!) until they can’t be played any more. Just like I’m going to die. It’s simply going to happen. So forget about keeping it in ‘mint’ (or ‘mint-minus’) condition. I don’t care about that. I care about being able to put the needle on it and having it go round and round and being able to turn up the volume and simply letting it wash over my heart and my soul. I care about cleaning my ears so I can hear every tiny nuance, including the scratchy clicks and pops of the vinyl medium. I’m also not a walking compendium of musical factoids. I don’t know what Miles Davis ate for breakfast on the morning he headed into the studio to start recording Kind Of Blue. I don’t know if Freddie Mercury brushed his teeth before tracking “The Prophet’s Song” (though I’ll bet he did). Some people pride themselves on that kind of mastery over minutae. Cool. Go for it. That’s not me. I care about living, breathing music. I want to write it. I want to record it. I want to bathe in it. If it’s living, it salivates, sweats, and pulsates. It emanates passion and vibrancy, just like those heroes who laid down those tracks in ’75. In ’59. Before I was even born. I am not a white glove-wearing collector. I don’t care to own a $60,000 turntable. I don’t have an awesome record collection, nor do I strive to catalog my records alphabetically, chronologically, or autobiographically. 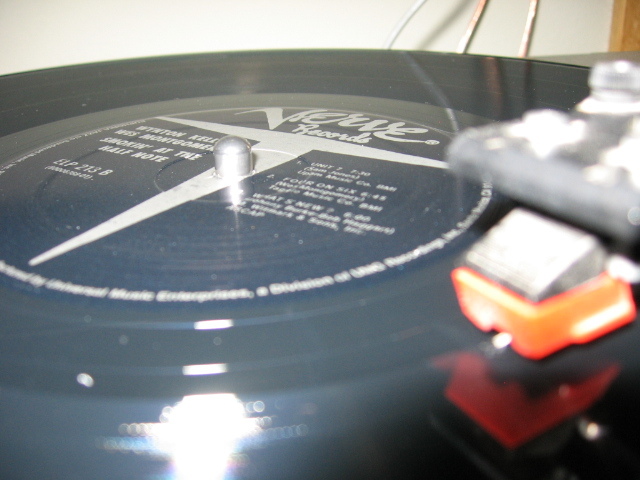 I’d rather drop the needle and wallow in the music than put down plastic protectors on the couch and carefully observe. I’m going to die. But the music never will. Why on earth am I writing about soup on my music blog? Mainly, because I want to live a balanced life. Music is part of my daily existence. But it doesn’t make up 100% of my day. Or week. Or year. The more balance I maintain, the better my music’s going to be. And the more deeply I’ll be able to appreciate the process of creating it. I play guitar. Write lyrics. Record, edit, mix down. Upload. Publicize. Market. Perform. One thing is clear: healthy, delicious, homemade food makes you play guitar better. It’s a proven, scientific fact. Here’s a recipe for a soup that Cheryl made yesterday. 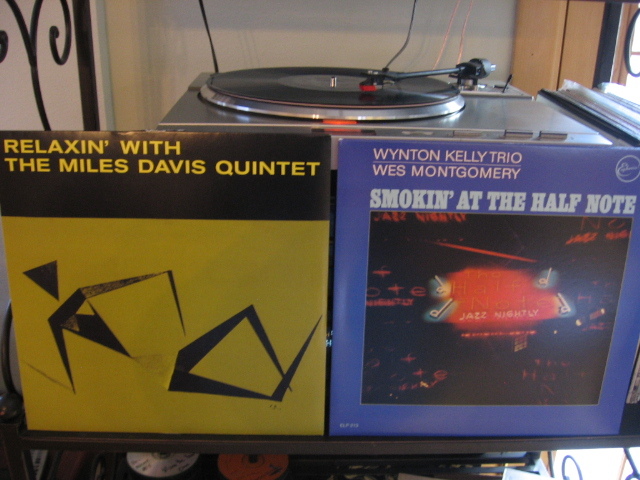 WARNING: For best results, this recipe should be followed while listening to Miles Davis: “Relaxin’ With The Miles Davis Quintet” and The Winton Kelly Trio/Wes Montgomery: “Smokin’ At The Half Note”. 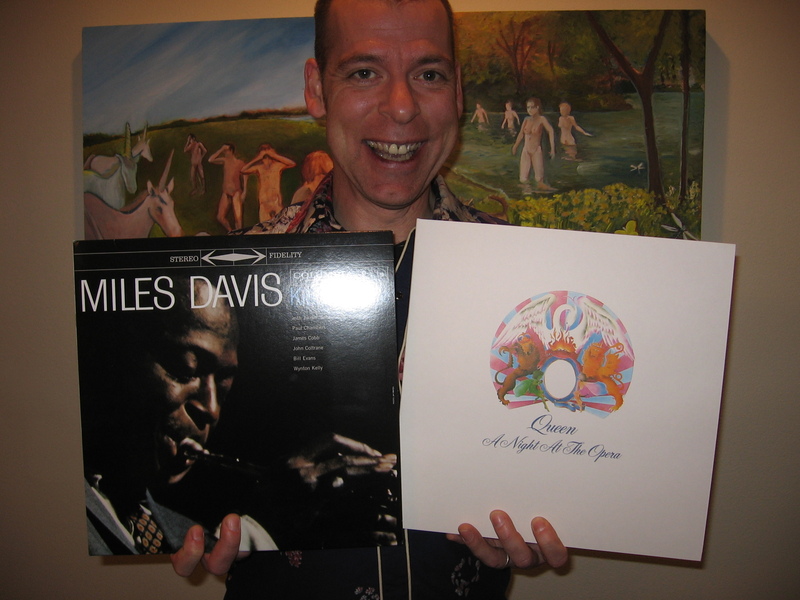 Extra delicious flavor will be imparted to the soup if you’re listening to these recordings on vinyl. Brown the ground italian sausage or links. Saute garlic in butter for 2 minutes. 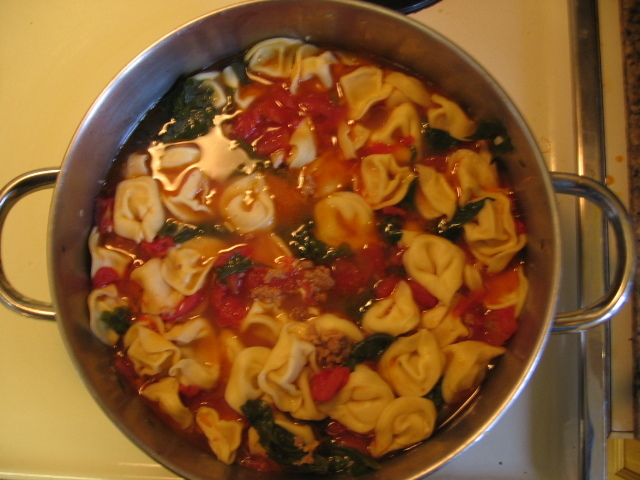 Add tortellini and cook 5 minues. Cook until the pasta is tender. Serve with fresh grated parmesan.